Blue Cat Audio has released an update of its all-in-one multiband dynamics processing plug-in, Blue Cat's MB-5 Dynamix. The new version brings better crossover filters as well as user interface enhancements. 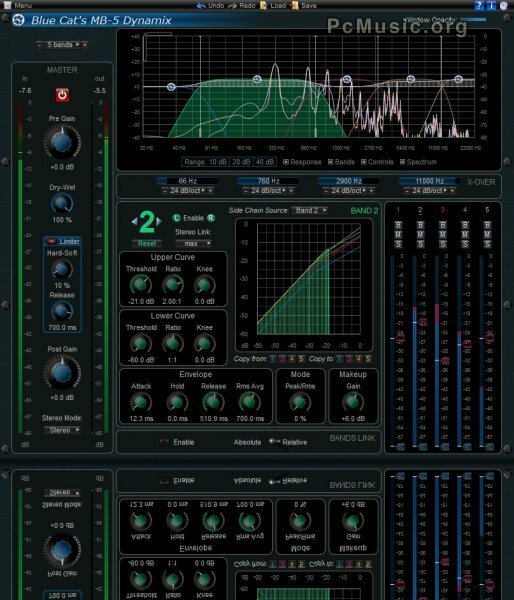 Blue Cat's MB-5 Dynamix is an all-in-one multiband dynamics processor that can act as a multiband compressor, limiter, expander, gate or waveshaper. It offers up to 5 separate bands and all types of effects can be combined together. The bands can also interact with each other thanks to cross-band side chain capabilities. The plug-in can be purchased alone or within several bundles. It is available in VST, Audio Unit, RTAS or DirectX formats for both Mac and PC. For this occasion and to celebrate the holiday season, Blue Cat Audio also launches winter special offers (20% discount) on their entire audio plug-ins catalog, until December 31th.